We took a short break from posting last week, but we’re back at it this week with bunch of new recipes. We did try a few new recipes in addition to the one noted below–Kim made Strawberry-Buttermilk Muffins to have around for breakfast, Buffalo Chicken Salad from the Skinnytaste’s cookbook, and the Kitchn’s Honey Garlic Shrimp. All three recipes were quite delicious! We’ll kick off the week with a special dinner: Rachel Khoo’s Crispy Skinned Duck Breast with a Cherry Sauce and Creamy Spinach and Polenta. We have some duck breasts in the freezer that we purchased during our last day trip to Long Island. We’ve been waiting for a good time to make them and with a quiet day planned and a slower-than-usual week ahead with the holiday, this Sunday seemed perfect. We made this dish once before and it turned out great, so we’re excited to try it again. We’ll start our 4th of July celebration early and have dinner with our friends Tom and Sharon on Monday. 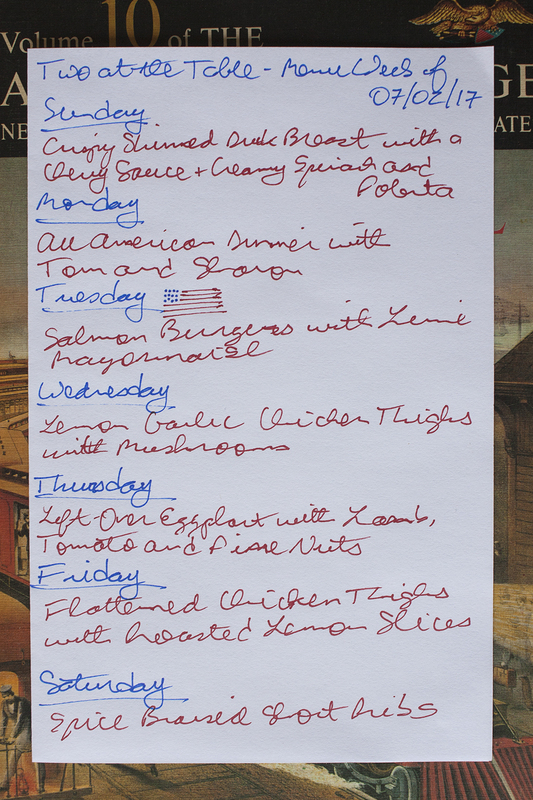 They are planning an All-American Dinner in honor of the holiday: Tom will make burgers for our main course, Kim will make brownies for dessert, and we are sure all the other items Tom and Sharon are making will be delicious as well! Since we’re having burgers on the 3rd, we’ll stick with that theme for the 4th, but lighten things up bit by making The Kitchn’s Salmon Burgers with Lime Mayonnaise. This recipe shows how easy it is to amp up plain mayonnaise: add some lime juice and lime zest and boom! You have lime mayo. One of our other favorite ways is to add some chopped up adobe in chipotle and bam–you have chipotle mayo. Okay, that probably exhausts the best possibilities, but you get the idea. We’ll try a new chicken dish on Wednesday: The NY Times’ Lemon and Garlic Chicken with Mushrooms. We’ll have mushrooms left over from this dish, as we bought a bit more than we absolutely need, so the extras will probably find their way into a frittata at some point this week. We’ll have leftovers on Thursday night, from a dish Kim made last week: The NY Times’ Eggplant with Lamb, Tomato, and Pine Nuts. This was an incredibly savory and satisfying dinner that was that much better thanks to the one key ingredient not named in the title of the recipe: mozzarella cheese. Lots of good, fresh mozzarella cheese. We’ve already had this as leftovers once and it heats up very well, so we’re looking forward to having it again. We’re back to the New York Times and another chicken dish on Friday, one that is different enough from the Lemon and Garlic Chicken with Mushrooms, especially in preparation, to keep things interesting: The NY Times Flattened Chicken Thighs with Roasted Lemon Slices. The key to this recipe is cooking the chicken thighs in a cast iron skillet, skin side down, with a heavy weight on top (yet another use to which we will put our Dutch oven and yet another reason to wonder how we ever managed to do anything in our kitchen before we got it) to get the thighs nice and crispy. This dish can be served in the skillet in which it is cooked, which should make for a fun presentation at the dinner table. It should be a perfect Friday night dinner. As you may have seen recently, The New York Times Cooking section now requires a subscription (to the section or the The New York Times overall). So if you don’t have a subscription, the links likely won’t work. We personally applaud the New York Times for take a bold stance in terms of paying for good content–we are happy to do so ourselves. We’ll go big on Saturday to close out the week and make Real Simple’s Spice Braised Short Ribs. This dish takes quite a while to cook, as the short ribs have to braise for about three hours, but we don’t have any plans for Saturday. The apartment might get a bit warm, but that seems like a small trade-off for the prospect of the apartment also slowly filling with the smell of braised shot ribs. We expect the neighbors may come knocking!